Gellius Terentius is the son of Count Regulus Terentius of Bravil. He's quite snooty towards people he doesn't know, but he has a dirty little secret (that everyone knows about). 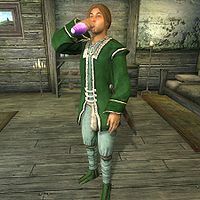 He's addicted to skooma and visits the Skooma Den weekly to replenish his stash. A chest containing skooma can be found behind the headboard of his bed. Gellius usually spends all his time lounging about the Lord's Manor North Wing in the castle. He sleeps in his private quarters between midnight and 6am. He attends the formal dinner at 8pm and eats for four hours. The rest of the day, he simply wanders around. He only leaves the north wing on Loredas, when he makes his weekly visit to the Skooma Den. At midday he heads out to S'Krivva's house to seek her out, and once he has found her, he will make his way to the Skooma Den and stay there until midnight. Gellius wears a set of upper class clothing: a green brocade doublet, a piece of jewelry, a green silk garment and a pair of green velvet shoes. He is armed with a steel shortsword and has the keys to S'Krivva's house, Bravil Castle interior and exterior. He carries a pewter mug and a large amount of gold. Speaking to Gellius Terentius will have him ask that you leave him alone: "Surely... you must know who I am! The Count's son. Do you mind? I have no desire to be further acquainted with every visitor to Bravil." When asked about Bravil, he will show you just how rude he is: "Yes. Bravil. How clever of you. You've already learned the name of the town and county. I see a great future for you in public service."